It’s not often I find a major art event near me here in the fens of East Cambridgeshire, but in September 2018 the Cambridge Art Fair was held in the new surroundings of the Quy Mill Hotel. Located just off Junction 35 of the A14 and with free parking, this was a big risk on the part of the organisers to move the event from the Guildhall in the centre of Cambridge where footfall would have been much higher and the location more prominent. Personally I was really pleased when I heard the event was moving out of the centre of Cambridge; for those of us who live outside of Cambridge it is becoming more and more difficult and time consuming to travel into the city, so most trips (for me at least) get planned with other places in the centre to visit. For me this used to be a trip to the Fitzwilliam Museum to visit the galleries for inspiration – I always come away from there in awe at the artwork on show in the permanent collections. I also felt that the Guildhall was both a little too small and disjointed with its layout for the art fair. Some of the exhibitors were in a side room with the café, whilst some were placed high up on the stage at one end of the main room. The Venue (the permanent marquee at the Quy Mill Hotel) offers a larger space with plenty of room to walk around, all the stands are on one level and there’s a much more natural flow as you walk around. I attended the Private View on the evening of 27th September, thanks to an invitation sent by Linton59 /The Darryl Nantais Gallery who have previously exhibited my own work in their gallery. The first of many positives is the ample parking and ease of getting to the venue. Ok – disclaimer time: I live less than a ten minute drive away from the venue on a route that is second-nature to me so I found it a doddle to get there. I’m hoping others found it the same as me! I was greeted by the event organisers at the entrance, grabbed a drink and headed into the venue. Running alongside the art fair for the first time was the Inspire Cambridge home show a new event for the region presented by Velvet Magazine showcasing local/regional and independent professionals, suppliers & contractors working in the homes, interiors & property industries, complemented by fabulous, locally produced, artisan food & drink too. This year’s charity partner for the event was the David Parr House, an extraordinary house in Cambridge which is currently being renovated thanks to Heritage Lottery funding so that it can be opened to the public. The organisation had a fascinating stand at the fair, with objects from the house and collection on display. The Cambridge Art Fair offers the largest sale of 20th and 21st century original fine art and prints in the Eastern region and just standing in the middle of the entrance area and looking around you can see that this is true. There’s always an eclectic mix of landscapes, figuratives, sculptures, abstracts and still lifes and this year was no exception. With 20 exhibitors (plus Beau Art Interiors at the PV only) there’s plenty to be drawn to as you walk round. There were a good number of people attending the PV, and it was good to see a number of sales across many stands within the first few hours of the evening. This online gallery is run by brothers Andrew and Matther Farmer, based in Yorkshire. I met Andrew last year at the art fair, having seen his own work on Instagram and Twitter. He is one of a number of en plein air artists who are advocating and advancing the popularity of plein air oil painting; indeed if the recent Paint Out in London organised by the British Plein Air Painters group is anything to go by when nearly 100 artists gathered in St James’ Park there is a revival happening across the UK at the moment amongst the artist community. Not only were Farmer originals on display but also the work of other plein air artists. I was particularly captivated by the painting ‘Fishing Boats’ by Maria Rose. A new favourite artist of mine, with a simple yet very technical style of painting that conveys the most information in the fewest brushstrokes. I enjoyed this stand with its mix of different mediums on display. The gallery, based in the Cotwolds, specialises in Original Contemporary 21st Century British Art: From Paintings; abstract, landscape and still life to Sculpture, Ceramics and Glass. The stand out piece for me, as a fan of landscape art, was the piece called ‘Hireath’ by Conrad Clarke (I couldn't find a website for Conrad at the time of writing). Though only a small piece it packs a punch with its thickly applied oil paint with hints of underpainting poking through the layers. 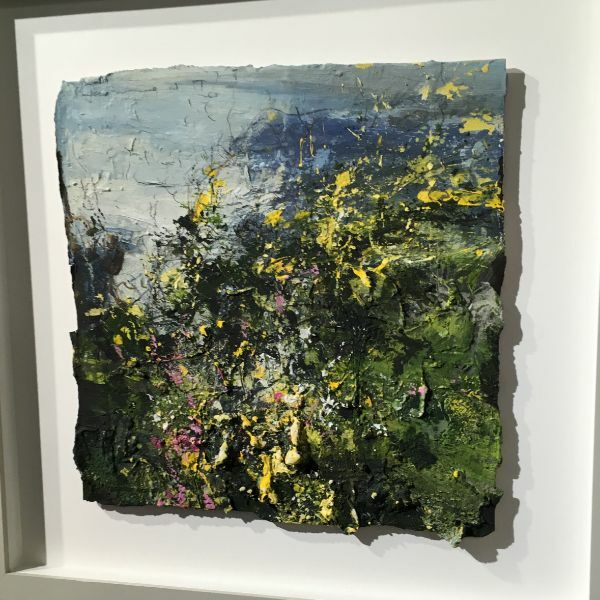 The Robert Fogell Gallery has exhibited previously at the art fair and features contemporary and British Modern art and crafts from leading and emerging artists. One of my favourite and inspiring artists is the British artist Chris Prout. I can see the influence of other modern artists like David Tress in Chris’s work, with the use of texture, colour and bold marks creating atmospheric work which invokes a sense of place as you view the piece. Other exhibitors of interest to me were the Art of Cambridge, Eleven & A Half and Gallery East who all displayed a varied range of artworks from traditional to contemporary, abstract landscapes and still lifes. From a visitor’s point of view there really wasn’t much to complain about the event. Lighting in some corners of the marquee was insufficient (this was an issue at the last fair at the Guildhall) which will need tweaking for next year – it looked as if some stands hadn’t booked enough lights for the event but that’s something you learn by trial and error. That really is the only complaint I have! With a great mixture of art, a good quality easily accessible venue and plenty of space to move around, in my opinion the risk of moving out of the city was a good decision overall. I don’t know what visitor numbers were like across the three days the event ran compared with previous years, and I don’t know what the total value of sales were either, but from the exhibitors I spoke to personally they all expressed the same opinion that they would return to the event based just on the PV sales alone. For details of next year’s fair check out the Cambridge Art Fair website for more information.